The ruling party has scored sweeping victories in elections held in the majority of Russia’s regions on Sunday. March 13 was marked on calendars nationwide as the day of elections for practically all of Russia – of the total 83 subjects of the Russian Federation, 74 held elections. In 3,208 polls, voters elected 20,452 local legislators and heads of executive bodies. Sunday’s turnout was higher than in the last year’s regional elections, while the number of violations reported turned out to be apparently lower. 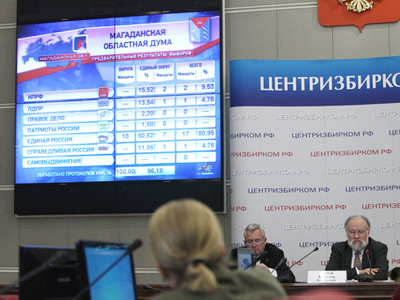 The elections’ preliminary results have validated United Russia’s leading positions in the present political arena. The party’s members are expected to clinch a majority in legislative bodies of 12 regions. In the Kaliningrad Region, Russia’s western exclave, and the Republic of Komi, United Russia reportedly bagged about 50 per cent of voters’ confidence. In the Chukotka Autonomous District, results there came to more than 70 per cent. In the Tver and Orenburg regions, about 40 per cent of voters gave their votes to United Russia’s candidates. A similar result was shown in Kursk and Nizhny Novgorod regions, as well as in the Khanty-Mansyisk Autonomous District. United Russia’s leadership has stressed that Sunday’s polls have started a campaign in the parliamentary elections to the Sate Duma due to be held on December 4. “The voting in 12 regions is the best sociological survey,” said Boris Gryzlov, chairman of the party’s supreme council. He believes the March 13 elections will bring United Russia more votes than similar regional polls held last year. The politician even predicted the growth of voters’ sympathies in the ruling party during the December elections. The Communist Party (CPRF), which reportedly came in second during the March 13 elections, has already accused United Russia of using “dirty tricks” during the campaign and on election day. 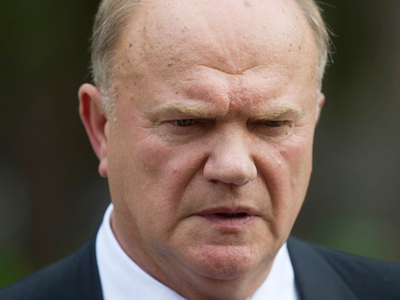 “There has never been such an outrage like this before,” the party’s head Gennady Zyuganov bemoaned. The Communists have pledged to comb through all reports about violations. At the same time, the party’s leaders said the CPRF managed to consolidate their positions and reported “steady growth” in support of the party. Meanwhile, Vladimir Zhirinovsky, leader of the Liberal Democratic Party (LDPR), has noted “positive changes” during the spring campaign. But LDPR also reported violations during the elections in Saratov, Orenburg, Stavropol, Kursk and Tver. Officials from the Central Election Commission (CEC), however, declared that the single election day “proceeded smoothly.” The number of complaints did not exceed those during previous elections, said Leonid Ivlev, a deputy chairman of Russia's Central Election Commission. 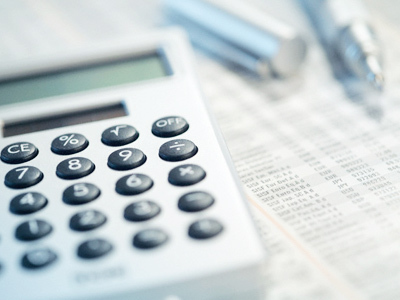 About 20 complaints regarding irregularities came from State Duma deputies, and more than 30 – from political parties. More than 60 cases of violation during the elections were reported to police. Prime Minister and United Russia head, Vladimir Putin said the results of the elections were “more than satisfactory for United Russia members and have demonstrated Russians’ confidence in the authorities.” The party scored sweeping victories in all regions where elections were held and has strengthened its positions, Putin said in Tomsk on Monday. In some regions, however, the ruling party lost about one percent, the prime minister noted. He explained this by the lack of co-ordination in party officials’ activities. “There is nothing strange here, the party has to clean up its ranks,” he noted. Putin has not decided yet, if he will head United Russia’s list in the December 4 parliamentary elections. It is still too early to speak about it, he said, promising to discuss the issue with colleagues in the party. In 2007, when then-President Putin headed the list of United Russia’s candidates, the party secured a constitutional majority in the parliament’s lower house, the State Duma. Prior to the March 13 elections, the political struggle heated up, taking on radical forms in some cases. The head of the Central Elections Commission, Vladimir Churov, even had to demand that the law enforcement officials penalize all those involved in pre-electoral violence as well as conduct some preventive measures. “The electoral campaign methods that were taking place prior to March 13 were more a characteristic of the residents of the Wild West than one of a very large democratic country – with feathers, mini-van races and baseball bats, which also are a characteristic of this very country. I can say that this is all going to end badly,” Churov said. On Friday, on the last day before the official 24-hour quiet period on electioneering, politicians continued to exchange blows. A deputy from the Liberal Democratic Party spoke in the lower house and accused “unknown persons” of numerous violations, such as distributing fake leaflets with his party’s symbols and using planted data in campaign material. The deputy did not directly blame the parliamentary majority, United Russia, but the accusations of using administrative resources made this statement point the finger at United Russia, being the most popular party among top regional officials. 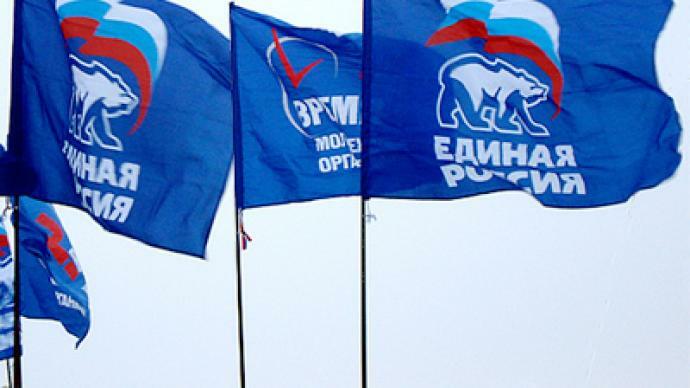 United Russia also accused its opponents of using dirty tricks. Deputy Aleksandr Khinshtein said that while the sad facts of wrongdoings are a reality in many Russian regions, the blame lies not with United Russia but on its opponents, first of all the Fair Russia party – the political fraction that just like United Russia supports Vladimir Putin’s political course but uses leftist and socialist rhetoric. Khinshtein went on to accuse one of the Fair Russia candidates of having mafia connections, but the party’s deputies dismissed these claims as groundless.